NCMGMA Boasts Largest Advocacy Days Ever! With over 115 attendees in-house on Wednesday, NCMGMA celebrated our largest-ever Advocacy Days event. Our speaker lineup this year included Attorney General Josh Stein; Chip Baggett, NCMS; Cody Hand, NCHS; NC State Treasurer Dale Folwell; Dr. Mandy Cohen, DHHS; and a panel that include four of the newest Medicaid Managed Care payors. Our speakers and panelists brought our attendees up-to-date on everything from the State Health Plan to the latest happenings with Medicaid Managed Care. Joint HHS Appropriations Committee for Medicaid Managed Care and the importance of awareness of the additional requirements now shifting to the providers due to multiple types of Insurance Carriers. Additionally, changes to the Fee for Service contracts moving to value-based care contracts and the administrative burden shifting to providers. The Save Act asking providers not to vote for this bill as supervision from physicians is necessary to maintain the highest quality of care for our NC residents. HB184 – Study of State Health Plan Design, asking to keep the bill as it currently is until more definite options are in place for quality and cost savings for the members and tax payers. S886 – In favor of the Small Business Healthcare Act reducing employees from 26 to 12. 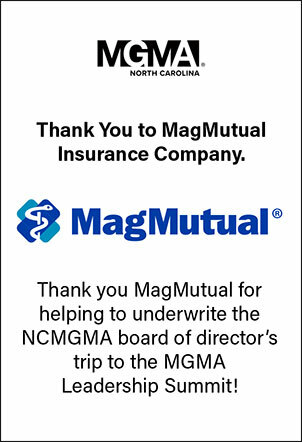 Thank you to all who came out for this year’s Advocacy Days, and a big thank you to Melissa White and Cam Cox, NCMGMA’s Advocacy Days co-chairs, for all their hard work in putting this event together for our members! Click here to view the complete list of conference sessions and to start making plans to join your colleagues in Wilmington in May. In response to MGMA member concerns whether new Medicare Beneficiary Identifiers (MBIs) contain the number “0” or the letter “O” on new Medicare cards, CMS clarified that the MBI uses numbers 0-9 and all uppercase letters except for S, L, O, I, B, and Z. As a reminder, starting Jan. 1, 2020, Medicare will only accept the MBI on claims, and practices can access their MBIs via your Medicare Administrative Contractor web portal. Download the member-benefit New Medicare Card Toolkit for additional information on the transition to the new cards and numbers. 2019 promises to be another busy year in healthcare. The 2018 midterm elections shifted the balance of power in Washington as Democrats now hold the gavel in the U.S. House of Representatives, creating a divided Congress with the Republican-held Senate. MGMA has identified the following legislative and regulatory issues critical for medical practices in the coming year. We will keep members apprised of key developments in these areas and their impact on medical practices and will continue to advocate for policies that enable practices to thrive in their mission to furnish high-quality, cost-effective patient care. Despite an anemic pipeline of new voluntary Medicare alternative payment models (APMs) trickling out of the Department of Health and Human Services (HHS), Secretary Alex Azar is planning a new approach to accelerate participation in risk-based APMs. Forgoing incremental implementation, the Secretary is expected to unveil new mandatory models in 2019 and to emphasize performance-based risk as a necessary component of any new APM. MGMA strongly supports voluntary participation in APMs when it makes financial sense for individual practices and disagrees with the Secretary that the way to expedite the move to value-based care is to mandate participation. We will continue to advocate for new opportunities for practices to participate in voluntary APMs and for development of more physician-led models. It is expected that Congress and the Administration will continue to work toward reducing the regulatory burden on medical practices participating in government healthcare programs. The Centers for Medicare & Medicaid Services’ (CMS’) “Patients Over Paperwork” initiative is one such example. However, this has translated into only modest relief for practices thus far, as 88% of MGMA members polled reported an increase in overall regulatory burden last year. MGMA will continue to make regulatory relief a top advocacy priority in 2019. Keep up with our efforts at mgma.com/regrelief. As part of the effort to accelerate payment innovation, HHS leaders pledge to revisit antiquated fraud and abuse rules such as the Stark Law and Anti-Kickback Statute. In 2019, watch for proposed rules that expand exceptions and safe harbors to protect value-based arrangements and benefit providers willing to take on performance-based risk. While a push to simplify Medicare compliance rules is welcomed, it is likely that congressional intervention will be necessary to achieve meaningful reform. It remains to be seen if Congress will also prioritize this issue in 2019. Medical practices can expect to see a push to curb surprise medical bills, including efforts to empower patients and consumers through improved access to healthcare cost information. The sticker shock of surprise hospital bills continues to make headlines and draw bipartisan attention in Congress, making this issue ripe for legislative action in 2019. With a new Congress and support from the Administration, reducing Medicare drug prices is on the action list for 2019. For physician-administered drugs, one proposal seeks to curb the price of drugs in Part B by tying prices to a new International Price Index, create new private-sector vendors to supply practices with drugs, and set drug administration cost as a flat fee. CMS is also looking to give Part D drug plans greater flexibility to negotiate drug prices in protected classes. Implementation of the Merit-based Incentive Payment System (MIPS) continues to ramp up. In 2019, MIPS performance will determine whether clinicians receive a positive or negative payment adjustment of up to 7% on 2021 Medicare reimbursement. Medicare is accelerating cost accountability for MIPS clinicians by increasing the cost component to 15% of the overall MIPS score and introducing episode-based measures. The performance threshold required to avoid a payment penalty also doubles from 15 to 30 points in 2019. With more on the line this year, it is critical that MGMA members prepare their practices for success. Visit mgma.com/macra for helpful resources. The Office of the National Coordinator for Health Information Technology (ONC) is expected to release regulations to meet requirements of the 21st Century Cures Act and facilitate improved data sharing between healthcare entities. ONC will define and seek to discourage “information blocking,” develop a framework to facilitate data movement between heath information exchange entities, and release specifications for the use of apps to foster data exchange between different providers and between providers and patients. The goal of using apps, a component of MIPS and Stage 3 Meaningful Use, is to permit practices to efficiently and securely move administrative and clinical data via their EHR. Medical practices can be a prime target for phishing and other cybersecurity attacks because they possess valuable information assets (patient clinical and financial data) and often have inadequate cybersecurity protections. HHS’ HIPAA enforcement arm is expected to ramp up audits and fines in 2019. Medical practices should protect both their data and business continuity by completing a comprehensive risk assessment, identifying vulnerable areas of the organization, and taking the steps necessary to mitigate risk. Check out MGMA security resources to prepare your practice this year. Policymakers will continue the trend toward site-neutral payments with the goal of equalizing Medicare payments for the same services across clinical sites. Medicare expanded this policy through 2018 rulemaking by phasing-in payment reductions for clinic visits at hospital outpatient departments (HOPDs), including HOPDs excepted from previous site-neutral payment rules. In addition to saving money for patients and the government, site-neutral payments are viewed as a policy lever for increasing market competition, eliminating the incentive for hospitals to purchase freestanding clinics and leveling the playing field. This shift in power within Congress will recast the role the federal government plays in healthcare in 2019. With “Medicare for all” a key platform for many progressives during the 2018 primaries, the politicized debate over a single-payer health system shows no signs of slowing down and will likely gain steam ahead of 2020 elections. Passage of any major health reform bill is highly unlikely anytime soon. However, as presidential contenders begin campaigning for the 2020 primaries, universal healthcare will almost certainly become a point of debate. You know that can you’ve been kicking down the road? Well, don’t look now but it’s starting to roll back! by John Lillie, Senior Strategic Accounts Manager, CMS Imaging, Inc.
And it’s more like a 55-gallon drum that is slowly picking up speed. Ordering providers don’t have to abide by what was shown to be the best imaging modality; they must only demonstrate that they consulted AUC through an approved mechanism. Failure to consult an approved AUC will cause the professional and technical component reimbursement to be denied – as in zero-dollar reimbursement. That should get your attention. The goal is admirable: reduce the number of inappropriate exams, which would improve the quality of healthcare by reducing dose where applicable. Good for the provider and good for the patient. However, as always, the devil was, and still is, in the details. Originally slated to go in effect on January 1, 2016, this initiative has been delayed time and time again, and thankfully so. Neither CMS, nor the providers, nor the industry was prepared to implement these standards. Like peeling away the layers of an onion, the deeper reasonable interests investigated the topic, the more challenges became apparent. Available space to devote to the resultant coding is an issue, for example. Moreover, what about those providers who still use the fax machine or paper orders? How are we going to get all providers, regardless of their specialty or size, to do this? These are real-world challenges. A more significant challenge is that not everyone knows enough about the AUC consultation requirement, the approved mechanisms, and all of the other details, and are nowhere close to implementing a workable solution. Plus, there is no funding mechanism provided externally to help you to comply with the mandate. Assuming you have addressed this, I am quite sure that this was a pleasant conversation for radiology managers to have with their CFO’s (I sincerely hope you’ve had these conversations, right?). Apparently, many have not. In a recent survey conducted by the Association for Medical Imaging Management (AHRA), among the 291 total responses who responded to the question “Have you implemented or begun implementing Clinical Decision Support (CDS)?”, 35% responded Yes, 61% responded No, and 3% were not sure what CDS is (Source: Regulatory Affairs: Clinical Decision Support (CDS) 05/2018 Survey, released on July 5,2018). The good news is that since the passing of PAMA 2014, healthcare entities have far more choices available today as to which CDSM they would like to consider. The list of qualified Provider-led Entities (qPLE) who have been approved to “develop, modify, or endorse” Appropriate Use Criteria (AUC) are growing as well (see the list at the end of this blog posting). Newly approved qPLE’s are announced each June. The industry around Clinical Decision Support for Medical Imaging is growing. More choices allow for more informed decisions. More options will enable the marketplace to reward those who succeed and punish those whose products don’t pass muster. The AHRA has been at the forefront of working with the CMS and their members to find a solution. I count myself as a member of this organization, and I applaud their actions on this front. It is vitally important that the radiology industry examine, explore, and make their voices heard on the selection of the best CDSM for their facility. They should lead the charge on selection because it is their world that bears the responsibility for it to work. Moreover, they will be the ones penalized if they do not implement the change. The can that was kicked is now rolling back. According to Ms. Sferrella, the likelihood that this initiative will be again kicked down the road is “almost none.” While some may have hoped this would happen, or the initiative will die and go away, that is not going to happen. In summary, it is always a better outcome to plan and prepare before a crisis hits. Acting at the last minute, deciding and implementing a CDSM to make the deadline, usually results in panic buying and a whole lot of stress. There is still time, but it is running out faster than you think. January 1, 2020, is now just 12 months away. 2018 Alliance sponsor article provided courtesy of CMS Imaging, Inc. For more information, please contact John Lillie of CMS Imaging, Inc. – jlillie@cmsimaging.com.